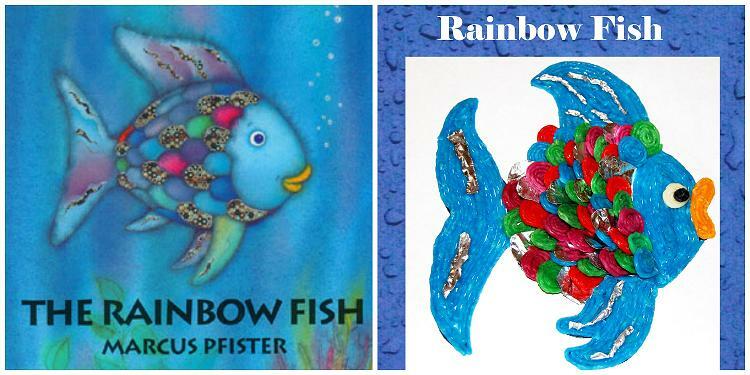 The Rainbow Fish by Marcus Pfister is a classic picture book adored by children and adults alike. The story of the fish with sparkly scales explores valuable lessons for kids. We read this book to our children each year after the holidays as it reminds kids that giving to others and remembering to be a good friend will bring joy that lasts the whole year through! Join us in creating a collaborative Wikki Stix Rainbow Fish Craft that the whole family can participate in. 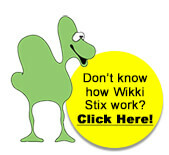 Set aside a “screen-free” family night to read and create together with Wikki Stix! • How do the children think the fish feel in the book? • How did Rainbow Fish feel about his beautiful scales? • Why do they think the little blue fish wanted Rainbow Fish’s sparkly scales? • Was Rainbow Fish a good friend in the beginning of the story? At the end? • Invite the children to talk about a time when it was difficult for them to share something. • Talk about the importance of asking others for advice/help when needed. • Invite the children to share a time when they felt happy about sharing. • Discuss ways to be a good friend to others. The Wikki Stix Rainbow Fish craft is a fun project to create after reading and discussing book. Make an area to craft for lasting memories and family fun this winter! Materials needed: Red/Green/Blue/Purple Wikki Stix (for the fish and scales), White/Black Wikki Stix (fish eye), Gold or Yellow Wikki Stix (fish mouth), aluminum foil (for the sparkly scales and fin decorations), fish template (download the fish template PDF here), and scissors. Load the fish template and laminate for durability if desired (if laminating supplies are not available, clear contact paper works well, too). Outline the fish template with blue Wikki Stix. Invite the children to trace the fish template with the blue Wikki Stix. 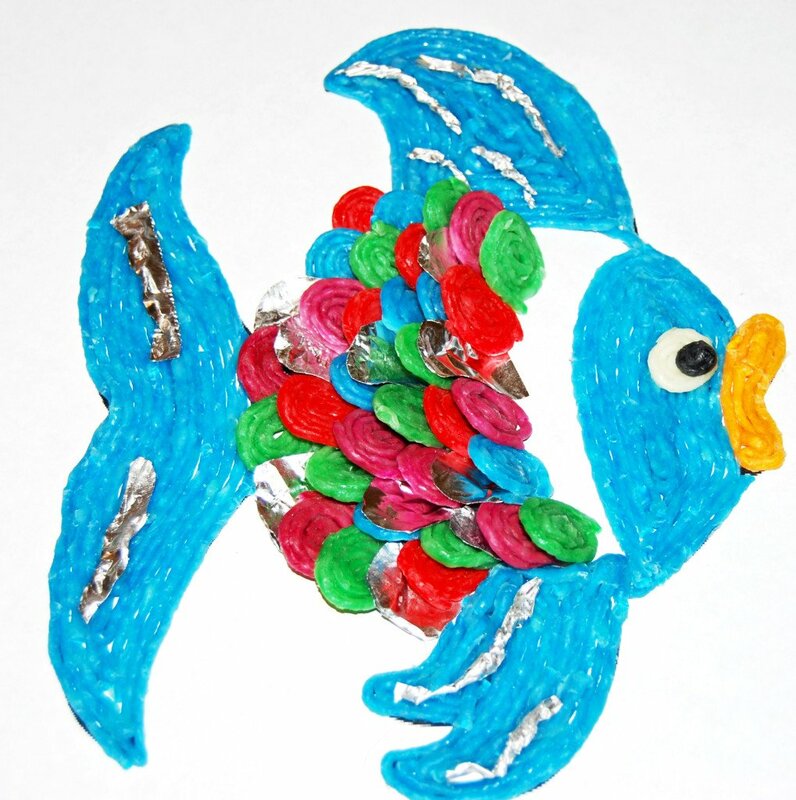 Older children may wish to fill in the tail/fin/head sections of the fish template with additional blue Wikki Stix. To create the 3-D fish scales: the fish scales are created by wrapping one Wikki Stix around itself to form a tight pinwheel shape. 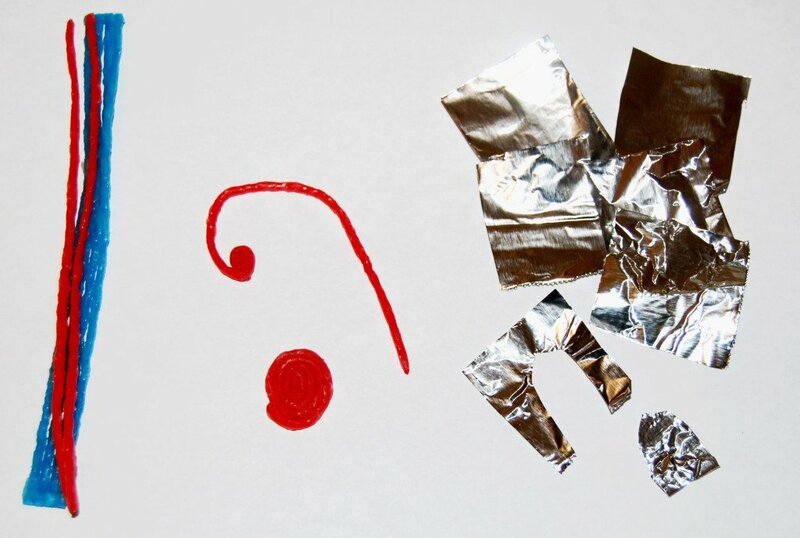 The sparkly scales are created from small aluminum foil squares that are cut into a scale or oval shape (see photo below). The scales can then be placed side-by-side and layered until the body portion of the fish is covered in scales. The sparkly aluminum foil scales can be placed randomly throughout the layered rows of scales. 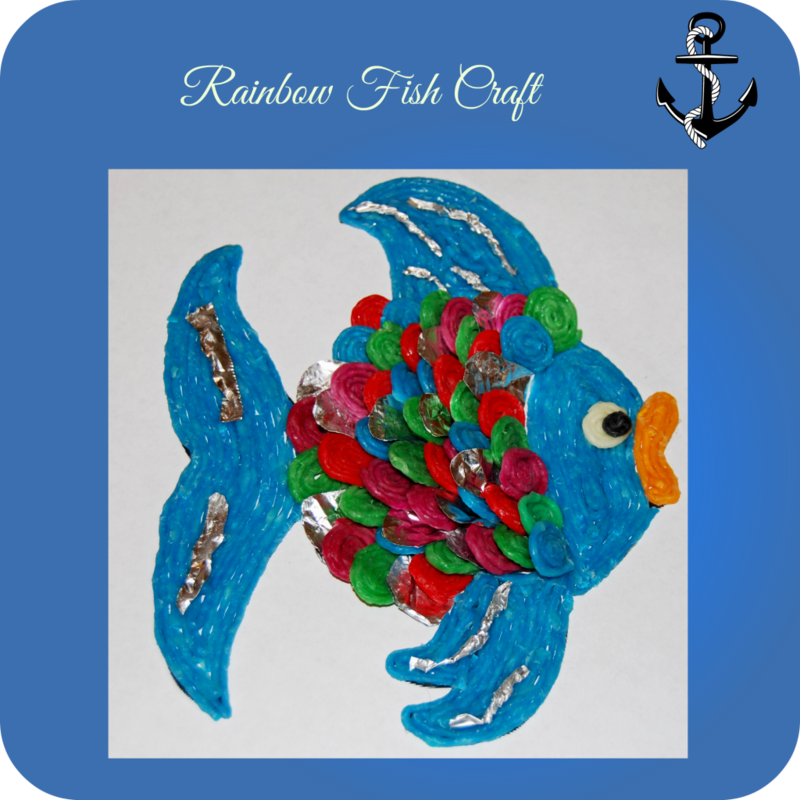 To finish the Rainbow Fish Craft: invite the children to create a fish eye from one white Wikki Stix spiral and a small black ball center, yellow or gold fish mouth, and add aluminum foil decorations on the fish tail and fins. The Rainbow Fish can then be lifted from the paper and displayed if desired. To create a hanger for the craft, fold one Wikki Stix in half (leaving an open loop) and press to the backside of the fish. Each week here on the blog you’ll find new ways to create, play, and learn with Wikki Stix. Be sure to check back for more books with Wikki Stix crafts coming each month throughout 2015!